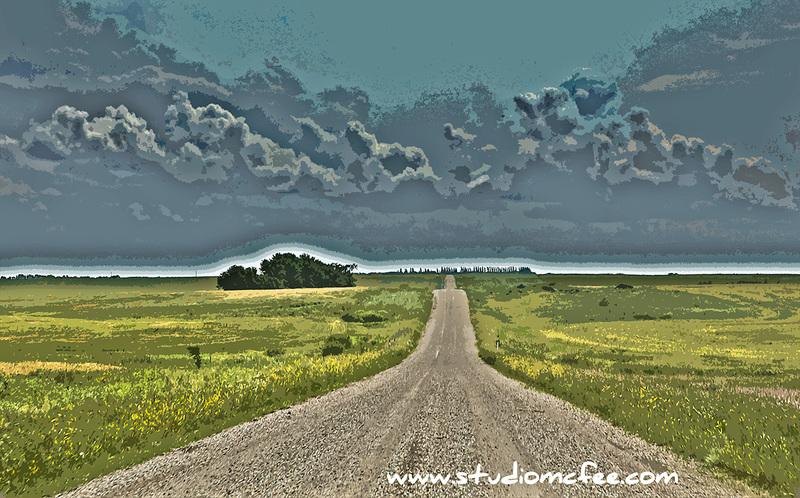 If you've spent any time travelling the roads of western Manitoba, the term 'big skies' takes on new meaning. On a sunny day the sky is everywhere, dwarfing the landscape, producing a sense of just how small we are in comparison to nature. On other days, thunderstorms (often several separate storms) can be viewed from afar and give plenty of warning that a storm is approaching. 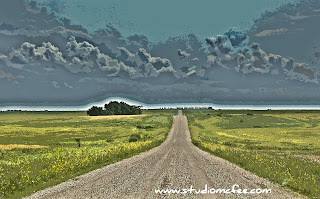 Big skies are inescapable on the Prairies. There are places in Manitoba were the land is quite flat but western Manitoba has a gently rolling landscape filled with 'bluffs' (clumps of trees) and 'sloughs' or 'slews' (marshy ponds). But even with this rolling landscape the horizons seem impossibly far away. One of my relatives refers affectionately to Manitoba as home "where I can see 40 miles out of my basement window." Big skies and distant horizons are a unique prairie experience rarely captured by photographs or paintings.